State Minister for Transport, Works and Housing, Hon. Richard Azan (2nd right); Member of Parliament for Central Manchester and National Security Minister, Hon. Peter Bunting (3rd right), walk on the newly repaired Bashie Road in Bellefield Manchester, which was officially opened on February 13. The work was undertaken under phase three of the Jamaica Emergency Employment Programme (JEEP) at a cost of $3.56 million. Rose Stewart could hardly contain her excitement as she gushed about the rehabilitation work done on the road leading into her Woodlawn Crescent community in Central Manchester. The project, which was completed last year, was carried out under phase three of the Jamaica Emergency Employment Programme (JEEP) at a cost of $2.6 million. A long-time resident of the community, located in Royal Flat, Ms. Stewart is ecstatic that the 0.6-kilometre stretch was repaired after being in a deplorable condition for many years. “I am so happy. I am excited about the road. For (many years), we have had to be walking/driving on roads (which were in a deplorable condition)…I (now) brag about my road…because I say yes, our MP and our Councillor came through for us, thanks be to them, thanks be to God,” she said. Ms. Stewart was speaking with JIS News following the official opening of the road on February 13. It was one of two Parish Council roads in Central Manchester, which were repaired under JEEP’s third phase. The other is the Bashie Road in Bellefield, which was rehabilitated at a cost of $3.56 million, and was opened at a separate ceremony. “You don’t have to tell them to drop you in anymore, they turn in and they speed down on our very nice, sweet, smooth road,” she boasted, while pointing to the added benefit of no longer having to pay extra fare for this service. For Wayne Forbes, a resident of the community for 42 years, the fixing of the road is something community members have been looking forward to for a long time. “We are happy the road is fixed now and everybody is enjoying the road…we appreciate it so much,” he told JIS News. Another resident, Doreen Pusey, said that as a 10-year member of the community, she is “very grateful” for the rehabilitation project. Ms. Pusey noted that during the course of the three-month project, she even cooked for the workers. Over in Bellefield, Jean Brown also expressed her appreciation for the “good work” of the Government. “We really appreciate what they have done here for us today, and I hope God will strengthen them so they can do more for this community,” she said. State Minister for Transport, Works and Housing, Hon. Richard Azan, said both roads are among more than 1,000 that have been completed under JEEP, since the programme commenced in 2012. The State Minister informed that additional road projects are either slated for commencement or completion in Manchester. Among them are the Old Porus Road, which will be opened within the next few weeks, while work will start shortly on the Old Kendall Road. Additionally, Mr. Azan advised that the Long Hill Road has been shortlisted for repairs under the project. “JEEP represents those small but high impact projects that the Member of Parliament, sitting with the Councillors, can plan to convert a dirt track into a paved (roadway), to put in an important retaining wall, (and) to put in a sidewalk where school- children, otherwise, would have to walk in the road,” he noted. “We really value this programme,” Minister Bunting added. 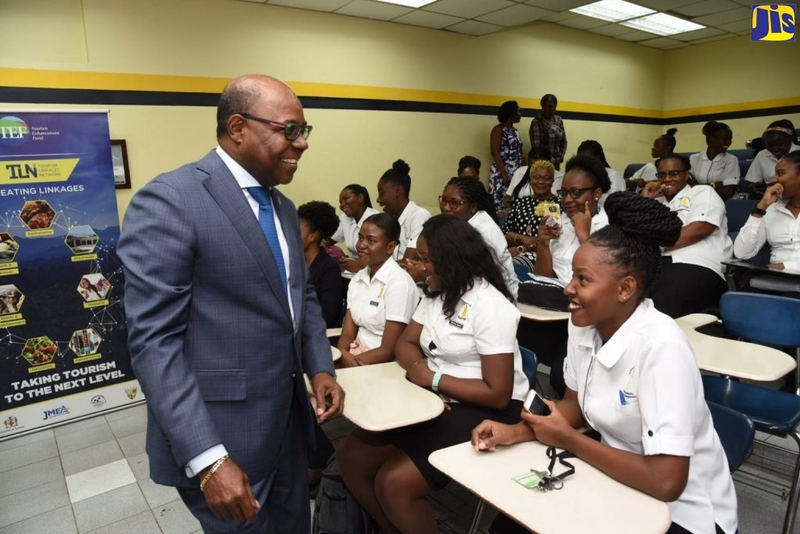 JEEP is one of the Government’s strategies to address unemployment, particularly among Jamaicans in the lower socio-economic groups, as well as persons with special needs, low skill levels, and those from under-served communities.